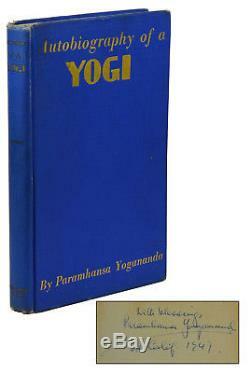 First Edition, First Printing Signed by Paramhansa Yogananda. New York: The Philosophical Library, 1946. 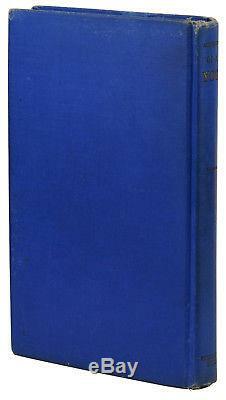 Publisher's royal blue cloth stamped in gold with blue topstain (perhaps a variant binding), lacking the dust jacket. Signed by Paramhansa Yogananda on the front free end paper, inscribed "with blessings" in California in 1947. Good+ with cloth worn, heaviest at corners and spine ends; gilt on spine is rubbed, boards faintly bowed. Pages toned and lightly thumbed. 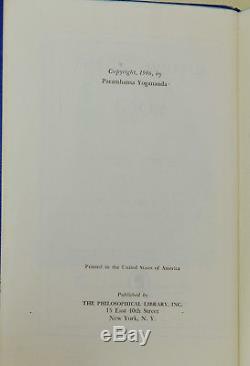 Books signed by Paramhansa Yogananda are scarce. 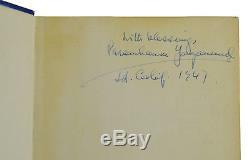 The item "SIGNED Autobiography of a Yogi PARAMHANSA YOGANANDA First Edition 1st 1946" is in sale since Thursday, March 22, 2018. This item is in the category "Books\Antiquarian & Collectible".